Reported civilian deaths fell sharply in Pakistan in 2012, with Bureau data suggesting that a minimum of 2.5% of those reported killed were civilians – compared with more than 14% in 2011. This suggests the CIA is seeking to limit non-militant casualties, perhaps as a result of sustained criticism. 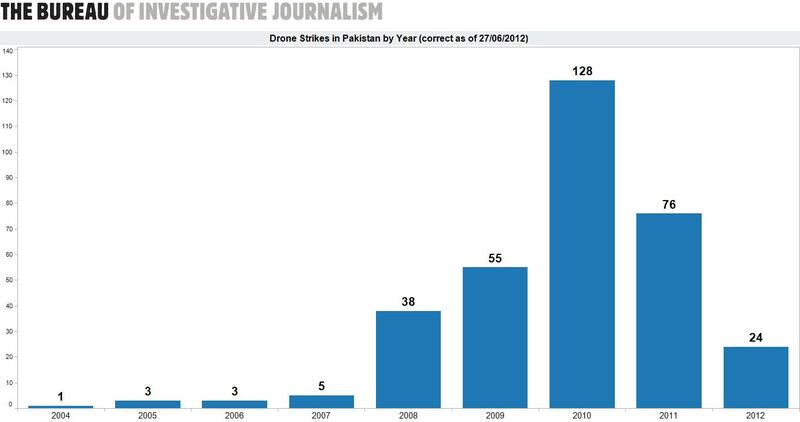 Drone strikes in Pakistan are now at their lowest level in five years, as Islamabad protests almost every attack. The CIA also appears to have abandoned ‘signature strikes’ on suspected militants fitting certain patterns of behaviour – at least for the present. Almost all attacks in recent months have been against named al Qaeda and other militant leaders. As drone strikes fell in Pakistan they rose steeply in Yemen, as US forces aided a major military campaign to oust al Qaeda and other Islamists from southern cities. A parallel CIA targeted killing programme killed numerous alleged militants, many of them named individuals. Yet US officials took more than three months to confirm that American planes or drones had killed 12 civilians. Little is still known about US drone strikes in Somalia, with only two credibly reported incidents in 2012. One of those killed was a British-Somali militant, Bilal al-Barjawi. In 2012,the US also chose to loosen the bonds of secrecy on its 10-year-old drone targeted killing programme. A number of senior officials went on the record about aspects of the covert war. But details of those killed – still a highly contentious issue – remain classified. The year also saw a number of significant legal challenges to the campaign, most of them ultimately unsuccessful. UN experts also announced a study into possible war crimes, partly in response to a Bureau/Sunday Times investigation. A major covert US military offensive in Yemen began in March. Its aim – in which it was successful – was to break al Qaeda’s grip on a number of towns and cities in the south of the country. 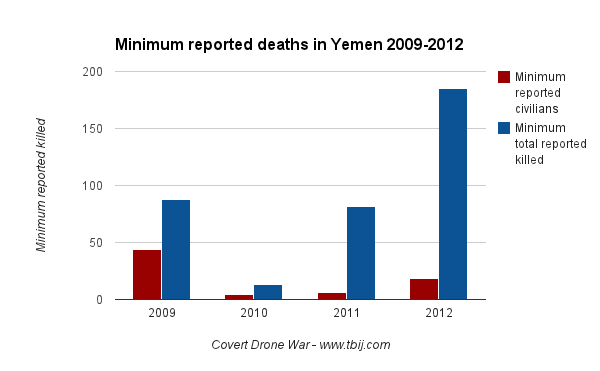 By late spring, drone strikes were occurring more frequently in Yemen than in Pakistan. One reason for a decline in Pakistani strikes may have been growing hostility. Some 74% of polled citizens said they viewed the US as an enemy, and uniquely Pakistan bucked a global trend to register as the only nation favouring Mitt Romney for president. In contrast, the American public appears to staunchly support covert drones – in one poll 83% of respondents were in favour of the strikes. The British High Court was called on in April to look into US covert drone strikes and possible British co-operation, which some lawyers in the UK insist is illegal. Days before the end of the year the High Court declined to investigate. After years of inactivity, US and Pakistani courts also began to consider legal questions surrounding the campaign. In June, Washington partially declassified aspects of the secret campaign, with officials openly acknowledging ‘direct action’ in Yemen and Pakistan. However the CIA’s parallel campaign remains classified – and Pentagon officials still refuse to release information relating to specific drone strikes. CNN found itself in the firing line in July when it claimed there had been ‘zero civilian casualties’ from US drone strikes in Pakistan in the first six months of the year. The Atlantic was among a number of publications which attacked the broadcaster for relying on error-filled data. One of Pakistan’s most senior diplomats told the Bureau and the Guardian in August that drone strikes were now undermining democracy. And in September, President Obama laid out the five rules he said need to be followed in covert US strikes, as it emerged that US ‘consent’ for strikes in Pakistan appears to rest on a monthly unanswered fax. October saw the publication of a major academic report by Columbia Law School into the reporting of drone strike casualties. Noting the problems all casualty recorders face, the study concluded that only the Bureau appeared to be accurately reflecting reported civilian deaths. An earlier study by Stanford and New York universities reached similar conclusions. The tenth anniversary of the first US covert drone strike in November received little US coverage, coming as it did days before the presidential elections. Both Obama and Mitt Romney had told voters that it would be business as usual if elected. And days after the 300th Pakistan drone strike of Obama’s presidency, the Bureau exclusively reported in December on declassified data which showed 1,200 US and British conventional drone strikes in Afghanistan, Iraq and Libya. Pakistan: The drop in strikes from their 2010 peak continued, and proportionally civilian casualties plummeted. Of at least 246 people killed in 2012 only 7 were credibly reported as civilians. 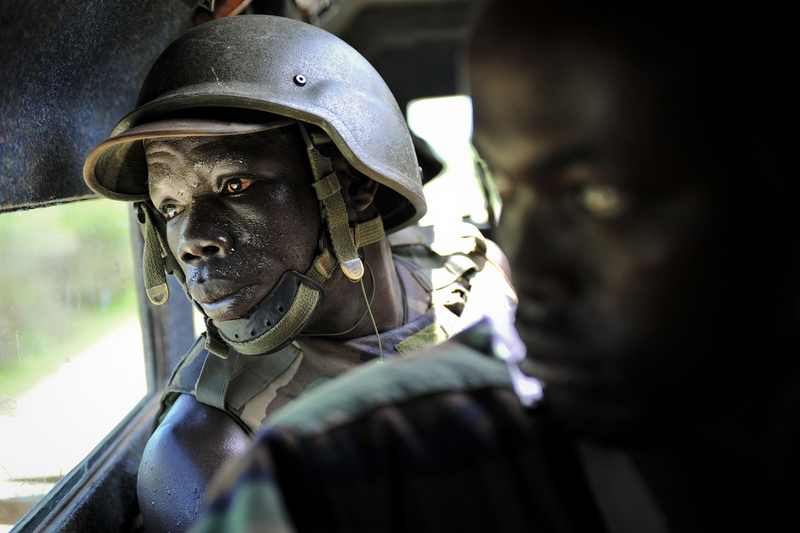 Last year 68 non-combatants were reported among a minimum of 473 dead. Yemen: After al Qaeda took and held a swathe of land in southern Yemen, the US responded by massively increasing the rate of drone and air strikes. At least 185 people were killed. But up to two thirds of the strikes and casualties exist in a limbo of accountability. Somalia: The US fight in the Horn of Africa is the most secretive in the covert war on terror. There were only two confirmed US strikes in Somalia this year despite evidence that operations are continuing unreported. 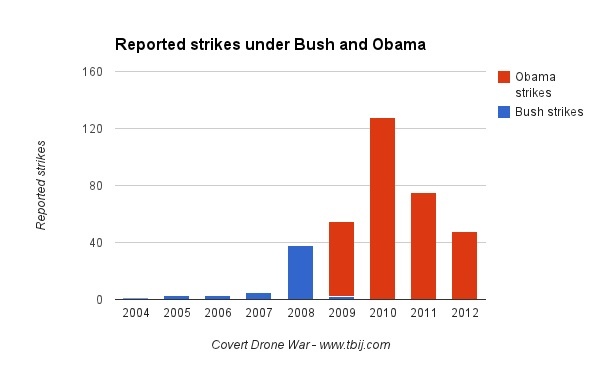 Under President Bush the CIA launched 52 drone strikes. Since then the Agency has launched 306 attacks under President Obama. The big story of 2012 was the steep fall in both the number of CIA strikes and casualties in Pakistan. Attacks resumed on January 10 after a 54-day break, following a Nato airstrike which killed two dozen Pakistani soldiers. Throughout the year prolonged pauses between strikes indicated the vulnerability of the drone campaign to external events. In April attacks again halted as Islamabad and Washington haggled over the reopening of supply lines into Afghanistan. There was no halt for the fast of Ramadan, the ‘month of peace’, as both the CIA and Pakistani Taliban continued their deadly operations. 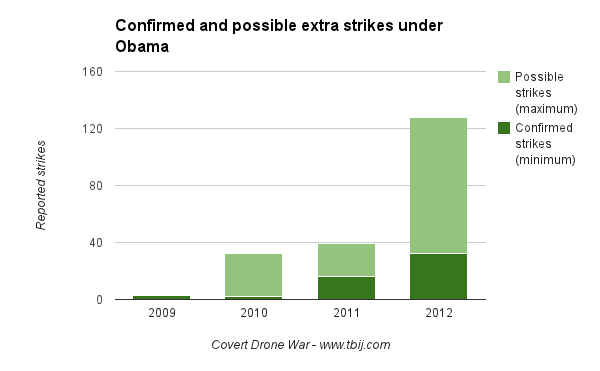 Overall there was a significant fall in the number of CIA drone strikes in 2012 – down two thirds on their peak of 2010. Even more marked was the proportional fall in the numbers of reported civilians killed – down from an estimated 14% to 2.5% of those killed year-on-year. The majority of non-combatants killed this year were close relatives – often the wives – of named militants. US operations have escalated over Yemen in the last 12 months. However the Bureau cannot yet confirm responsibility for 127 strikes since 2010 which may have been the work of US aircraft. Southern Yemen was gripped by a civil war in 2012 as Al Qaeda in the Arabian Peninsula (AQAP) and allies established their ‘Islamic Emirates‘ in the south of the country, exploiting the chaos of a popular uprising to tighten their grip. Once entrenched it proved too difficult for Yemen’s army alone to dislodge them. But in February President Ali Abdallah Saleh was overthrown and his replacement Abd Rabbuh Mansur Hadi invited the United States to help do the job for him. In March the number of airstrikes rose steeply, and the following month the CIA was given permission to launch signature strikes in Yemen. US operations peaked in May. Even after militants were driven out the violence continued. A suicide bomber penetrated security in the capital to kill 100 Yemeni soldiers and injure at least 200 more, a bloody portent of AQAP’s return to guerilla tactics. Following the ousting of AQAP from its southern stronghold US operations declined sharply. At present drone attacks are most frequently on named militants in moving vehicles, suggesting an effort by the US to limit the risk of civilian casualties. US or Yemeni officials often claim responsibility when senior militants are killed. In contrast there are rarely admissions of responsibility when civilians die in US airstrikes, as between 18 and 58 did in 2012. Only in December – three months after a dozen civilians died in Rada’a – did anonymous US officials admit that an American drone or plane had carried out an attack. Questions have also been asked about how effective US operations are. Analyst Gregory Johnsen has pointed out that AQAP membership had grown steeply since the US began targeting militants in 2009. As reported US air strikes have increased in Yemen so too have reported casualties. US operations remained largely a mystery throughout 2012. One more confirmed strike was reported this year compared with last. However the Washington Post reported that armed US drones continue to fly sorties over Somalia from a US base in Djibouti. And the Bureau learned that as much as 50% of US military and intelligence operations go unreported in Somalia. A UN study said that so many drones were operating over Somalia that several air traffic accidents were narrowly avoided. Because of the dangers of reporting from Somalia – Reporters Without Borders says 18 journalists have been killed in Somalia this year – there are no trustworthy reports of strikes or casualties. Only Iranian broadcaster Press TV consistently reports alleged US strikes. But while the Bureau monitors Press TV’s coverage we do not consider these reports reliable, and do not count them in our data. In September, Somalia’s first elected government for 20 years was finally installed in the capital, with new president Hassan Sheikh Mohamoud inaugurated. But days later, al Shabaab suicide bombers tried to assassinate him as he gave a press conference with the Kenyan foreign minister, indicating that the country remains in crisis.